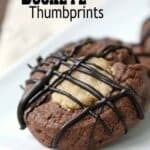 Buckeye Thumbprint Cookies, an easy chocolate and peanut butter cookie recipe! Make the filling. In a small bowl, beat together the peanut butter, powdered sugar, and 1 teaspoon vanilla with a spoon or electric mixer until smooth. Set aside. Preheat the oven to 350 degrees F. Line a baking sheet(s) with parchment paper. In a medium mixing bowl, whisk together the flour, cocoa powder, and salt. In a large mixing bowl, beat together the butter and granulated sugar for a few minutes until light and creamy. Beat in the egg yolk and 1 teaspoon vanilla until well combined. Beat in the dry ingredients, until incorporated. Drop the cookie dough (about 1 1/2 tablespoons per cookie) onto the prepared baking sheet(s) leaving about 2 inches between each cookie. Flatten the top of each cookie slightly, then using the back of a wood spoon or measuring spoon (or your thumb), make an indentation in the center of each cookie. Scoop out about 1 teaspoon of the peanut butter filling, roll into a ball, and press into the center of each cookie. Repeat with the remaining filling and cookies. Bake the cookies at 350 degrees F for about 15-16 minutes or until edges are firm. Let cookies cool on pans for about 5 minutes, then remove and place on wire racks to cool completely. When the cookies the cookies have cooled completely, place the chopped semisweet chocolate in a small microwave safe bowl and heat on 50% power for 30-second intervals, stirring after each interval until the chocolate is melted and smooth. Spoon the melted chocolate into a small resealable plastic bag. Cut off the tip of one corner of the bag. Drizzle the melted chocolate over the cookies. Let the chocolate cool and set before serving. SNAPPY TIPS: A medium sized cookie scoop works great for getting the same size for each cookie and for getting a nice round shape for these buckeye cookies. SNAPPY SUBSTITUTIONS: Instead of creamy peanut butter, you could use crunchy.